Market Research Future (MRFR)'s latest report indicates that the global industrial services market is set to mark a CAGR of 5.9% during the forecast period 2017 to 2023. The valuation of the market is predicted to reach USD 35.71 Bn by the end of 2023. The increasing market presence of maintenance as a service is likely to fuel the demand for industrial services over the next couple of years. Operational efficiency is the key focus for the industry leaders which has accelerated the adoption of Industrial Services Market in the recent times. The trend is very likely to continue over the assessment period, thus, augmenting the industrial services market. Additionally, the growth strategies implemented by service vendors such as service contracts agreements, product innovations, partnerships, acquisitions, etc. are expected to catapult the industrial services market on an upward trajectory. The rapid industrialization has paved the way for the growth of the industrial services market by necessitating operational efficiency for sustenance. The increasing complexities of industrial equipment have further opened avenues of growth opportunities for the market participants. The study reveals that the industrial services market is projected to witness constant growth over the next few years. The advent of industry 4.0 is prognosticated to revolutionize the expansion of the industrial services market through the forecast period. Other factors responsible for the growth of the market are standardization of price and quality, adoption of industrial automation, the need for optimum utilization of asset, rising demand from oil& gas industry, etc. Some of the key players profiled for a detailed assessment of the industrial services market are Siemens AG (Germany), Emerson Electric (US), Honeywell International Inc. (US), ABB (Switzerland), General Electric (US), Wood Group Mustang (US), SKF AB (Sweden), ATS Automation (Canada), Schneider Electric (France), and Intech Process Automation (US). By type, the global industrial services market has been segmented into installation and commissioning, service strategies, resource planning, maintenance strategy and planning, engineering and consulting, and others. 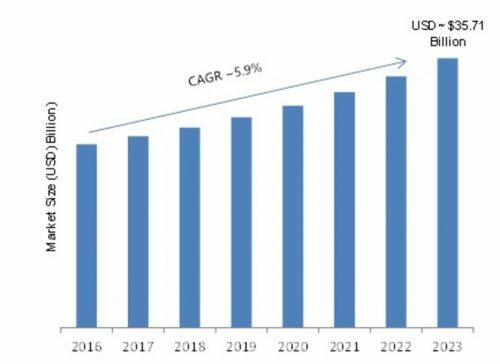 By application, the industrial services market has been segmented into human machine interface, distributed control system, manufacturing execution system, programmable logic controller, safety systems, and others. By end-users, the global industrial services market has been segmented into IT and telecom, transportation, metals & mining, food & beverages, oil & gas, and others. The global industrial services market, by region, has been segmented into North America, Europe, Asia Pacific, and the Rest of the World. Europe has secured a pole position and is expected to retain a dominant share of the market in the foreseeable future. The rising adoption of industrial automation in the region is poised to lead the expansion of the industrial services market. Furthermore, the presence of key players as ABB (Switzerland), Siemens AG (Germany), etc. in the region is expected to boost the growth of the market. North America is anticipated to witness a considerable rate of market expansion owing to the early adoption of technologies, and equipment complexities. Also, Asia Pacific is expected to thrive at a healthy CAGR across the review period. The growth of the region can be ascribed to rapid industrialization, technological innovations in the industrial sector, deployment of IIoT and cloud technology, etc. In November 2018, Thompson Industrial Services, a leader in the industrial cleaning business, has acquired Petrochem Services Group (PSG) for adding its specialized tank cleaning and vapor control services to the product line. In November 2018, B&B Crane Service, LLC, a North Carolina-based industrial company, has announced its plan for the expansion of its operations in Horry County, the U.S. state of South Carolina.